LONDON – It was difficult for passersby at Canary Wharf Winter Lights to take their eyes off Time and Tide. Created by the design partnership of Paul and Pute, the intricately shaped four-meter tall structure commanded instant attention with its seemingly endless patterns of ellipses and open curves formed by the intricate overlaying of steel and string. Glowing with the UV light from three CHAUVET Professional COLORdash PAR H12IP wash fixtures, the structure was in many ways a tribute to the power of technology and design. Paul from Manchester, England and Pute from Bangkok became friends while earning their masters degrees at the KTH Royal Institute of Technology in Stockholm. 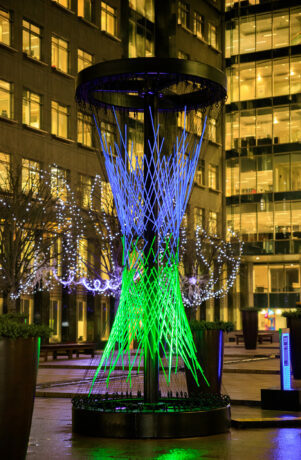 Together, they brought a mixture of architectural and lighting skills to the design of the hyperboloid-shaped work of art they created for the outdoor exhibit, which ended January 31. However, although Time and Tide celebrated the elegance of technology, it also served as a cautionary sign, reminding people to guard against its excesses. With an alluring shape evocative of an hour glass, the structure symbolized that the ecological timeclock is running out. As great art so often does, though, it also offered hope along with its solemn warning. The geometric web of strings that made up the structure’s surface was adorned with patterns created with paper drinking straws to remind people that there is an earth-friendly alternative to plastic models. Key to achieving the artistic and educational goals of Time and Tide was the UV illumination provided by the COLORdash PAR H12IP. Paul and Pute coated their paper straws with UV reactive blue and green paint, evocative of nature. Illuminating these straws with UV light endowed them with a vibrant glow, symbolizing how our planet itself can become more vital and alive when ecological balance is restored. “The COLORdash fixtures were a lifesaver,” said Paul. “We needed three IP-rated fixtures with high-output UV light and wireless scene setting. The UV paint couldn’t just be illuminated; it really needed to glow for the exhibit to move people the way we envisioned. This meant that our fixtures had to pack a punch. Supplied by 10 out of 10 Event Productions & Equipment Hire, the three COLORdash PAR H12IP fixtures were recessed into the circular base of the structure, pointed upward to illuminate the straws from different angles. Although the RGBWA-UV wash creates a rainbow of colors, Paul and Pute used only UV light to achieve the glow they were after. Time and Tide has proven to be so popular and effective at moving people to think of larger issues that Canary Wharf is considering making it a permanent exhibit. If and when that happens, there in the midst of the concrete steel towers of this busy financial center will be a beautifully balanced reminder about the importance of caring for our planet, one that blends aesthetics and message in a way that represents the best of art – and lighting.